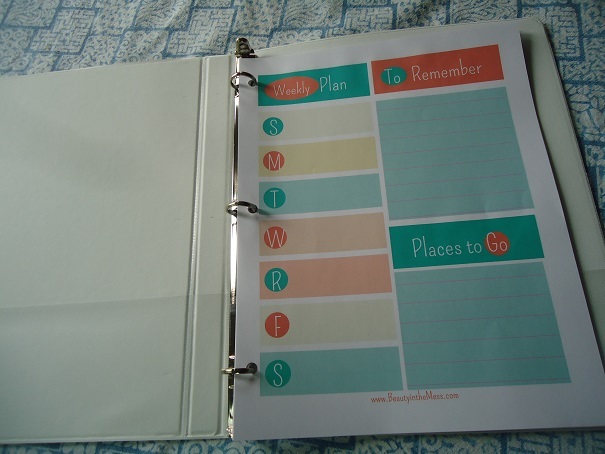 Want an update on how my new organizational binder is (or is not) helping me? I know. I’m one of the first to do it. This type of thing has never been done before. No one has ever heard of it. Planners? Calendars? What even are these? You know what? You people who have been doing this list thing since you learned to write words? You just laugh all you want. I’ve always been a “write-it-down” rebel. I’ve never wanted to be tied down to any list. Lists stress me out – as if writing it down means that I’ve failed if for some reason I can’t cross it off at the end of the day. There were too many days I’d leave too many items unfinished and un-crossed off. Boo. So instead I just kept my 40,000 item to-do list trapped in my head, swirling around, all day long. This is the main reason I’d stare blankly at my children when they’d ask about having friends over on Friday. In order to answer, the file cabinet in my brain had to pull out several drawers, and then the brain papers scattered, which means I provided several different facial expressions before I’d finally answer the can I have friends over on Friday question with put them in the pantry when you’re finished answer. What? My kids are used to it. If it has a day attached to it (such as Hannah’s reception, 2:00 Saturday, April 30) I write that down on the specific day. I’d already been doing some of that, because even I have understood the importance of writing those kinds of details on a calendar. If it doesn’t have a day attached to it but is only an I hope to get this done sometime before Malachi graduates in 2023, I write it on a general list. After all, if I wrote it on Monday and didn’t accomplish it on Monday, then I’d be mad at my list and we’d be right back where we started. You never knew I was so high maintenance did you? How’s my new organizational binder treating me, you ask? 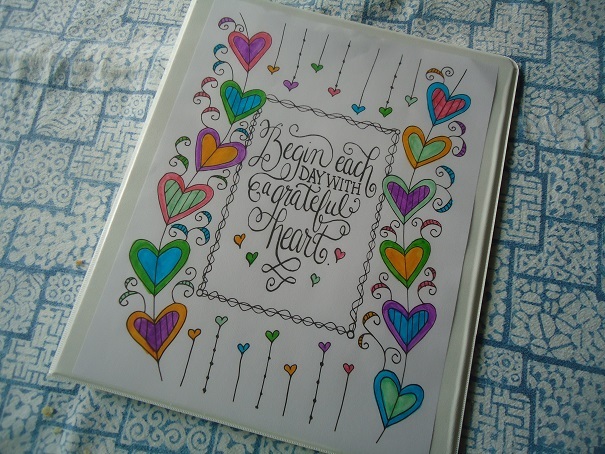 As I begin each day, I write down the must-do’s and the hope-to-do’s in my binder – in separate sections. 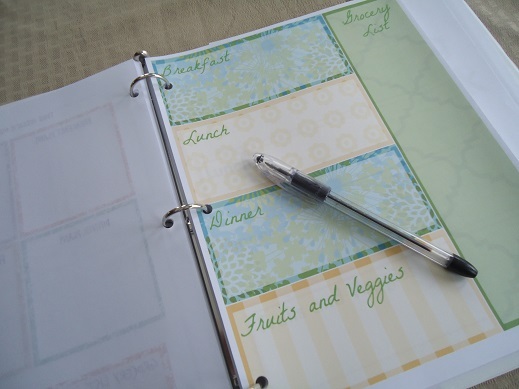 As they come to me, I jot down meal ideas on the meal planning page. As I think of recipes I want to try to invent and posts I want to write, I write them on a different list. Now if my kids say, “Can I have friends over on Friday?” I look on the calendar and say, “Yes. We’re free.” This isn’t nearly as much fun as telling them to put their friends in the pantry, but it is more efficient. My planner doesn’t own me. So what if I write down an idea based on a plan I have for the day or the week, but other needs arise and I don’t get it all done? Who even cares? I only need to do what I do. Not getting all of it done isn’t a symptom of failure – it’s a reality of life. Words on paper mean nothing (unless it’s the Bible or like a marriage certificate or something, but you know what I mean). But the simple act of writing down all the to-do’s and getting them out of my swirling head has truly been helpful. I shall continue this revolutionary idea of writing lists in planners. Maybe you all should try it sometime. No pressure. Are you a writer-downer? Or do you tell your kids to put their friends in the pantry? At the mention of my family’s Oatmeal Rebellion, many of you piped in with your ideas for quick and easy breakfast ideas. You shared some great suggestions, which made me excited to mention some more. You can NOT have too many helpful breakfast ideas in your back pocket. Although I don’t really recommend keeping your actual breakfast in your back pocket. That would be a bad situation on so many levels. While Sunday mornings are a bit crazy as we all try to get out the door looking halfway presentable…I’m going to also venture to say that every day can be hectic at breakfast time if we don’t have a plan. My kids are hungry from the moment they wake up. One of my boys would actually eat my leg if I didn’t shove an egg in his mouth as he rolls out of bed. He is that hungry. You’d think I didn’t just feed him four helpings of dinner the night before (and a snack before bed). 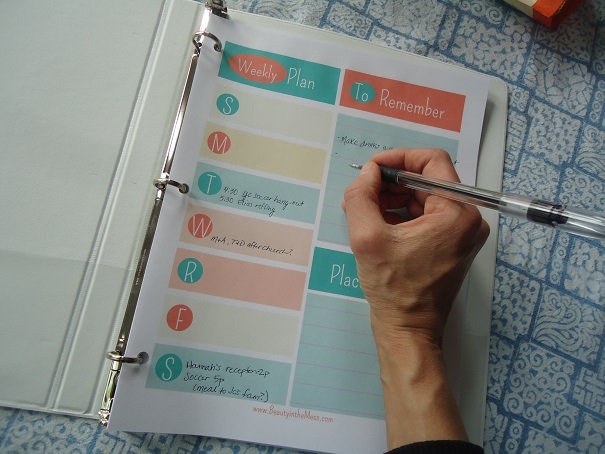 One of my best recommendations for us to keep our Breakfast Time Organized is to plan ahead. But my best, best recommendation is that if at all possible…make breakfast the night before. If I can, I bake our next day’s breakfast muffins or bagels or quick bread while I’m making dinner the night before. Or, I’ll start my pancakes or waffles to soaking. Or, I’ll mix up a Breakfast Casserole to have ready to bake the next morning. It’s easy really…to make breakfast the night before while I’m cooking dinner. I’m already in the cooking mode. I’m already making a mess. Might as well make a bit of a bigger mess and get breakfast baked up too, right? Then, after dinner, we get the whole kitchen clean (LOVE our Kitchen Chore Chart!) 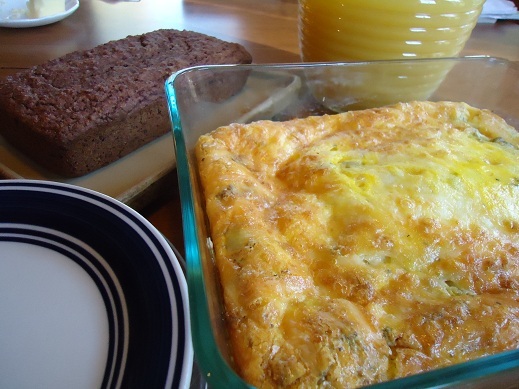 and put our breakfast on the table for the next morning (unless it needs to go into the fridge because leaving out a raw Breakfast Casserole would be about as bad as putting your breakfast in your back pocket). Add some fruit or a smoothie or a quick scrambled egg to round out these meals! Planning ahead and cooking ahead can save money and help your family to eat much healthier too. It’s much better than letting my son eat my leg, is it not? Part of this complete breakfast (and part of these giveaways) are brought to you by Say Mmm. Excited to hear more? 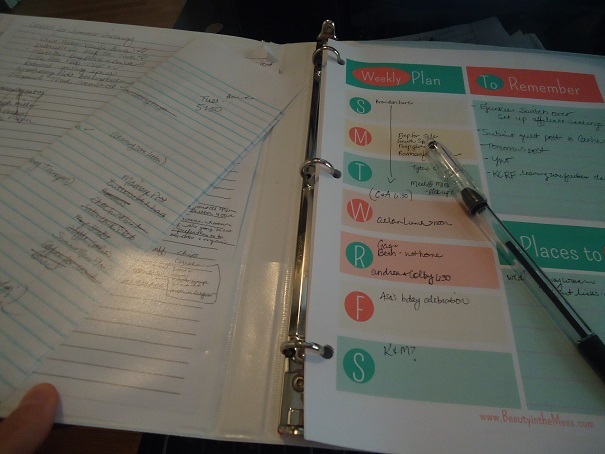 First, I encourage you to visit Organizing Junkie, who is sharing how she is using Say Mmm to create printable grocery lists. If you’re a blogger, you can link up your recipes and grocery lists with Say Mmm. Organizing Junkie shares how. I’ve shared about how I appreciate Say Mmm’s features for menu planning, grocery list making, recipe organization and more. Then, be sure to visit each of the following sites who are sharing their wonderful organizational strategies. Are you ready to hear about the giveaways already? 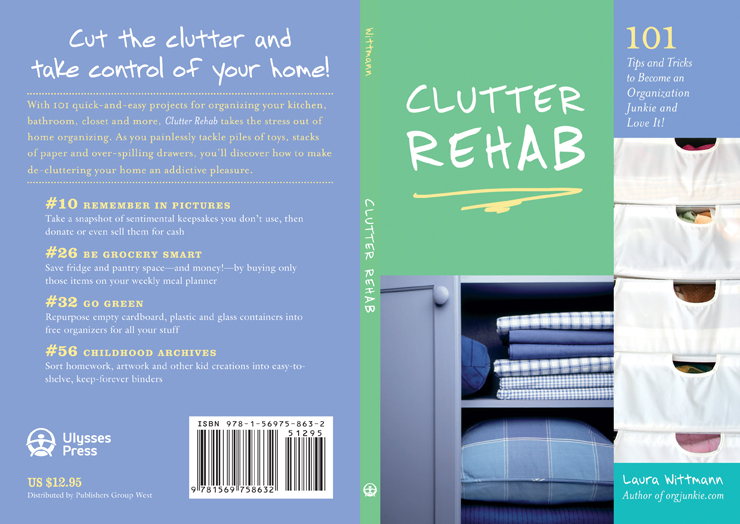 Thanks to Say Mmm, you have a chance to win one of four copies of Organizing Junkie’s book Clutter Rehab here at Heavenly Homemakers. Or, you could win one of three subscriptions to Say Mmm Plus (you can use Say Mmm for free, but subscribing to their Plus plan gives you even more great options!). And…I’ve thrown in three copies of my Do the Funky Kitchen ebook too, to help jump start you on your way to having an organized (and functional!) kitchen. Leave a comment here for a chance to win one of these ten great prizes! Plus, be sure to visit the above sites for additional chances to win!! If you visit all the sites and leave comments, you’ll have SO many more chances to win!! Kitchen Chore Chart – Free Download! 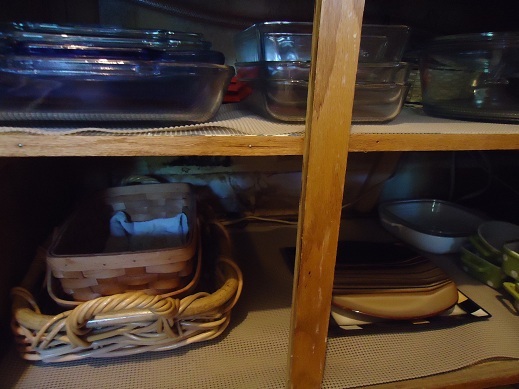 Well, I didn’t really know he was going to do this, but I thought it was awfully sweet that while I took the boys on a field trip last week, my husband Matt (did all the breakfast clean up and) wrote a guest post explaining our “Kitchen System“. The system was his idea after all, and it’s been working beautifully. So many of you asked about this system after I wrote about it last week…so here you go! Once it’s springtime again, I think I need Matt to write a guest post about how to build a raised garden bed, what do you think? My Heavenly Homemaker had too much of the cleaning responsibility in our kitchen falling on her. And I think she felt like the kitchen was falling on her sometimes. We have children ages 5 (he’ll tell you five and three quarters) through 13 right now. They should be doing more. Rarely will a child just magically hop in and do more. If you are blessed with one of those who jumps in and works hard, it is due to your parenting. BRAVO! If they need some help in this area, then likewise, it is up to your parenting. Laura and I recognized that our boys needed guidance in this area so we came up with a Kitchen Chore Chart aka The System. 1) In the early, training days of implementation it will probably take you and the team longer to complete the tasks than if you just did it yourself, but after proper training, it will pay off. 2) We are rotating the duties every meal and changing the lineup a bit daily in hopes that it won’t get old and because each day is different. 3) Obviously, older kids can do some chores that younger ones aren’t capable of yet, but don’t forget to graduate the younger ones onto higher expectations. 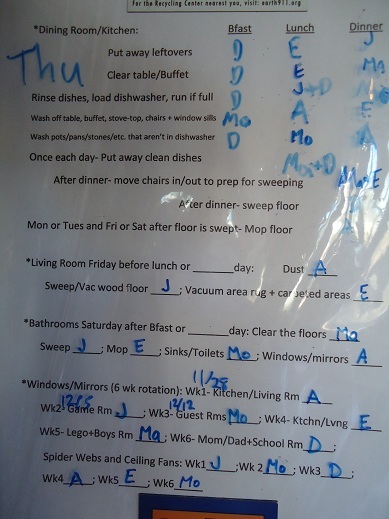 Right now our chart separates “Put away leftovers” from “Clear table/buffet” so that our youngest has a couple of different chores he can do or team up with someone else to do. In a year we’ll probably combine the two. 4) Ideally, the chart is updated for the following day at the end of the day so you aren’t scrambling, confused or arguing the next morning. Hmmm, does that sound like we have had that experience? so breakfast was a little out of the norm on this chart. Many hands, even mini-hands, make light work…when trained and organized. Laura here…I will state again what Matt said in this post: Download the Kitchen Chore Chart we’ve come up with to get an idea of what works for us, but be sure to revamp it to meet your needs! And just in case you were wondering, “Mo” stands for Mom and “Ma” stands for Malachi. And “D” stands for Dad because we couldn’t have another “Ma” that stood for Matt. Wow, this system is really complicated, huh? Okay, no, not really. I hold to our schedule lightly in order to keep myself sane. Well, close to sane as the case may be. I thought I’d try to share with you what our daily schedule sort of looks like….although it really isn’t a schedule. It’s hardly even an order of events. This will just be a little glimpse into what our days look like if we don’t have a field trip or a PE class or a leaky dishwasher or a hang nail. Our schedule has changed from year to year, but one thing has stayed the same: We always read the Bible at breakfast. We LOVE starting our kids’ day like this. We are currently reading a chapter of Matthew together, then reading a section from Why Pray? (Why Pray? is a GREAT read by the way!) Our older boys also read their Bibles on their own each morning before they come downstairs for breakfast. After breakfast/Bible reading begins a general organized hubbub. If possible, I sit down with Justus and Elias right after breakfast and read History and work through Spelling words. (You can see a list of their books and curriculum here.) Malachi (Kindergarten) heads off to play Legos or super heros or army guys or something else very manly. Asa begins his reading assignments for the day. He works on his own for most of the morning, making his way through his history books, literature and math. Once I’ve finished History and Spelling with Justus and Elias, they do their individual work (handwriting, math, phonics, vocabulary). IF by chance all the boys are working on their own without trouble at this point of the morning (of course I am available to answer questions at any time), I will start some laundry, wash some dishes, have a conversation with my husband (joy! ), cook something, or scrub some unidentified gooey substance from the kitchen floor. If I can, I try to put a big, nice meal on the table for lunch. Matt often works evenings, so I want to send him off with a healthy meal. I am finding that having good pre-made food in the freezer is a HUGE help for me since I don’t always have time to cook a big meal from start to finish during school time. Pulling something from the freezer and throwing some veggies on the table with it has been a life saver!! While we’re eating lunch, Matt works with us on memory verses. Have I ever written about how we do “repeat afters”? Why have I not ever written about how we do “repeat afters”? I’ll put that on my list. It’s so simple, yet so effective. While we’re doing “repeat afters”, I stuff my lunch down. Then, while the boys are still eating (because eating is an art form for them), I will read from our latest science book, then from our latest “read-aloud” book. They generally finish eating while I’m reading, but we all just sit around the table enjoying the books. I LOVE reading during meal times!!! After lunch, before the boys scatter…we’ll do a quick grammar lesson (Grammar Ace) or art lesson (Mark Kistler’s Draw Squad). After that, I sit with Asa and help him finish his History, Spelling and Science lessons. This has been a really great time with my teenager! While I’m doing this with Asa, Justus and Elias set the timer for 25 minutes and sit down in a quiet room to read. Malachi has gone back to his Legos again. Somewhere in there, we send Matt off to work (or soccer practice, depending on the day). Then finally, I call Malachi in to do his school work. I don’t do every subject with him every day. I don’t find it necessary. The main thing is that he gets it all done eventually…and he’s getting some one-on-one time with Mama. Now keep in mind that this order of events is how an “ideal” day looks. I’m actually finding that by staying very laid back about our schedule has helped all of us stay stress-free during the day! Sometimes we’re still finishing up some of our lessons at 8 pm. Sometimes we don’t get everything finished and have to carry our work over to the next day. I have given up assigning a “time schedule” to our days. I pretty much HATED having a schedule that said, “Science 9:00-9:30; History 9:30-10:00…” We could NEVER stick to a schedule like that (read here if you want to know why) and it always made me a Frantic Freaked-Out Mama. NO ONE wants to do school work with a Frantic Freaked-Out Mama! Not even me. I think that the main point is to just get everything done (mostly) and to keep the most important things the most important things. I don’t want my kids to remember school days with a Frantic Freaked-Out Mama. I want them to remember “repeat afters” and reading with Mama while they eat lunch and snuggling on the couch to learn about Abraham Lincoln. We get it all done somehow…so it doesn’t really matter what time the clock says, does it? Here are some other posts you may be interested in reading about how we used to accomplish “school” when we had littler guys and babies in the house! How Can I Do This Along With Everything Else I’m Doing?! Interested to know what a perfect day looks like at our house while we follow the awesome organized schedule I have set up for us? Yeah, me too. I’ll be sure to let you know what that looks like just as soon as we have one of those. Want to know what a real day looks like at our house? Now that I can tell you about. Messy, loud, fun, frustrating, silly, scattered, satisfying…those are the kinds of days we usually have. Schedule? Yes we have one…just because we have to have SOMETHING to go by so that we can accomplish SOMETHING. But if I were to force us each day to stick to the exact schedule…I would make all of our lives miserable. Especially my own. I’ve learned through these past eight years of homeschooling to keep our days flexible. To write down what I’d like a school day to look like and then to follow the plan loosely. Because just about the time I finally get all of my children in the room at the same time, settle them comfortably into their spots on the couches with pillows, wait for all of them to look up expectantly at me so that I can begin reading an enlightening chapter from our latest history book…someone is going to have to go to the bathroom. And while that someone is in the bathroom, another someone will remember that he forgot his pencil but on his way to go get it he will see the Lego man on the steps that he had been missing and then he will accusingly ask which of his other brothers left the Lego man on the stairs when clearly Lego men are not allowed out of the Lego room because this is how we lose Lego people and the other brothers (the ones that are not in the bathroom) will run to see which Lego man it is and then they will all go to the Lego room, forget all about history and start to build a space ship. In the meantime, the phone will ring with a call I can’t ignore and by the time I can corral them all back into the living room for history a good forty-five minutes will have passed and we’ll all finally get settled back down again…just in time for someone else to need to go to the bathroom. Somehow our children are learning in spite of all of the “life” that is going on around us. Hey, it would appear that “life” is what they need to be learning about anyway. Oh Look. My Closet Has a Floor. Our closet has some major issues. It has a big sloped ceiling (because it is under a set of stairs). It has lots of stuff in it and it is used mainly by little boys who don’t like to put their stuff where it goes. Well, if I had to suffer this kind of treatment all winter long, by February I’d look terrible and suffer a panic attack too. to the mailbox on a 45 mile per hour windy day in March, doesn’t it? At least there are some possible solutions for organizing the closet. My hair on a windy day? Well…let’s just stick with attainable goals shall we? I started by cleaning out all of the unused contents of the closet. There are six people who share this closet and four of them are boy children who like to play in snow…but do we really need nine pairs of snow boots? And can anyone actually fit into these little baby sized boots anymore? And why do we have so many coats? I am SO thankful for hand-me-downs, but how about we only keep the coats that currently fit someone and put the other sizes into tubs in the attic? (Although those coats will have to be taken to the attic by my brave and fearless husband because I’m still suffering bird-in-the-face trauma). I realize it doesn’t look like much of an improvement…but trust me…it is. Big fat coats and snow suits take up an incredible amount of space. Multiply coats, snowsuits and boots by my four children and two entire tubs are full. Why, you might ask, are you putting all of these items in tubs? Did we or did we not recommend hooks??? Yes, you did indeed recommend hooks, but I actually have very little wall space in my closet because of the sloped ceiling. I do have a few hooks, but they are quite high. And any other wall space that might sport a hook is directly behind where the big coats hang. Hooks, unfortunately aren’t working for me as a solution this time. My two big rubbermaid tubs fit nicely into the sloped space. The kids (after being gently reminded and then lovingly threatened with losing prized lego possessions) now remember to NEVER AGAIN put their coats on the floor, but to ALWAYS put their coats and boots in the correct tubs under the slope. See, coats in one tub and boots, roller blades in the other tub…gloves and hats in the crate. because he’s the daddy and Mommy said it was okay. Since the hooks are a little bit too high for the little guys, I assigned one hook to our oldest/tallest son (who would never dream of putting his coat on the floor in the first place). I’m using the other hooks for my shopping bags so that they don’t get mixed in with the kid’s boots. Are you impressed? Probably not. Tubs and crates are really not that exciting. Someone who utilized some really adorable and trendy looking storage containers should totally win this challenge. But after several weeks of not seeing the floor of my closet and being incredibly frustrated with my children every time I need a shopping bag and have to dig for five minutes under muddy snow boots…I’m pretty stinkin’ excited. This post is linked to Organizing Your Way. Ever since I wrote this post about our homeschool schedule and promised to do a “Day in the Life” post…I’ve been TRYING to take pictures of a day in our life. Wow…I didn’t realize how tricky that job would be. The days of our lives are um…eventful. Especially during soccer season. I had a hard time taking a picture journal of one entire day. Here are all the boys eating pancakes for breakfast. Even though our days can look quite different when it comes to the schedule…we always work to make time for our Breakfast/Bible Reading time. I let the boys choose a quiet activity while I read History to them. Of course…the day I took this picutre they decided to color. Probably because I had mentioned in this post that my boys almost NEVER sit quietly and color. Had to prove me wrong, didn’t they? Elias (2nd grade) usually needs help with his math…so here we are working on it. A special thanks to photographer Justus. And I suppose after looking at this picture it’s apparent that I don’t usually take the time to do anything with my hair on a typical school day? Yeah, it’s not in the schedule. I actually got some Pre-K time with Malachi on this day. I sort of sat in the middle between Elias and Malachi and worked with both of them at the same time. Asa hides out in an upstairs bedroom to work on his math. We found that it cuts his math time in half if he’s alone in an upstairs room vs. if he’s down in the kitchen where there are always lots of distractions. 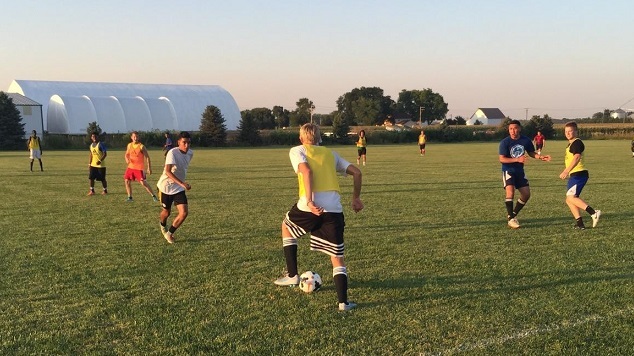 One day after Justus finished his independent work…he mixed up cookies for a post-season soccer party he was to have with his team. The party wasn’t until the weekend, but we talked about how busy our upcoming weekend was going to be and decided to make them mid-week and freeze them. MAYBE he’s learning to plan ahead? Maybe. Sometime in the afternoon everyone sits down for reading time. From the quality of this picture…it kind of looks like I make everyone read in the dark, doesn’t it? Elias was sitting across the room and I couldn’t get all of the readers in one picture. This cutie is going to town with chapter books this year! I think this picture sums up our days quite nicely. I took this last Wednesday right before I tried to cook dinner in this mess. It was our last 70 degree day before we knew it was going to get cold. SO…I left the dishes and the rest of our school work and all afternoon we worked outside to pull in all of our peppers and tomatoes and okra and potatoes. Oh, and we went and picked apples at someone’s farm too. After working for HOURS outside, then bringing it all in…here’s what the kitchen looked like. Shew! Some of you have asked how long our school day takes. Every day is different. Sometimes reading History takes ten minutes…sometimes it takes an hour. Usually we are finished by 2:30 or so (if we start about 9ish). That’s with taking a lunch break and a short play break. Often it depends on how focused the boys are on their independent work. Really, you should all just come for a visit. Would Someone Please Hand Me a Schedule? We finished our “scheduled” schooling right about the end of April. In the weeks since we finished, I’ve been pretty laid back about having any kind of routine. I think it’s nice after having nine months of order to kick back and just do whatever, whenever. But somehow, the lack of routine doesn’t set well with me after a few weeks. I don’t feel quite as productive. I don’t want the boys to get into a “what? you want me to actually do a chore?” mode. I don’t want the summer to go by and find that we didn’t really accomplish anything. I need a schedule. I need some routine. I need productiveness. So, pardon me while I kind of think out loud here as I try to create some sort of organization for our summertime. It may not be pretty. Feel free to tune me out. Clean up our storage room. Organize books in the school room. Keep up with the housework. Read the Bible and work on memory work. Okay, well thank you for putting up with that. Even though it’s a loose schedule, I feel better now. What do your summers look like? Do you try to keep a schedule? The boys have been begging. I finally said yes. We finally pulled out all of our clothes and did the great switch from winter to summer clothes (leaving some sweats and jeans and sweatshirts in the closet just in case because packing all the warm clothes away is a sure way to make it snow). I clean out and organize the boys’ closets twice a year. In the meantime…we receive boxes and bags of hand-me-downs. When this occurs…do I carefully sort and organize the clothing we receive? Nope. I throw them into the back of a closet until unti the next biannual closet clean-out. Why, you ask? Because I’m lazy like that. Because our clothing bins are in the attic making them hard to get to. Because we don’t need the clothes yet. Because I don’t want to. Because the clothes we receive are likely not to fit anyone yet anyway. And because organizing clothing twice a year for four growing boys is plenty for me. it into the back of the closet. That pile was several feet high. We pulled it all out and it looked like this. I asked Matt to bring our clothing containers down from the attic and the boys started pulling out all of their favorite shirts…and talking at once…and asking me loud questions like “will this shirt fit me this year?” and “oh can I have this one?”. Malachi was crawling all over me and into my well ordered piles and into the containers. It was a fun organizational moment. The kind that makes me want to not let them help me. But…I know they love helping me with this job, so I kept myself from screaming for Calgon to take me far, far away and let them go a little nuts for a while. The clothing bins are now ready to go live in the attic again until the next time I feel like we need a little family insanity. And…I was able to take a very full container of clothes to the clothing giveaway at church we hosted over the weekend. 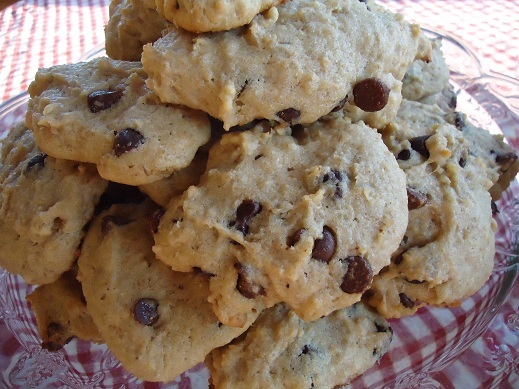 You can go visit Tammy’s Recipes for more “Pile Clean Up” motivation.